The Stiga PARK PRO 540IX front deck is designed for the medium to large sized garden. 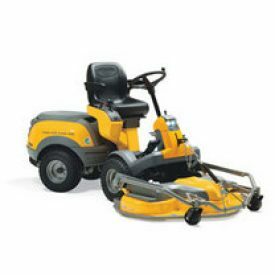 Powered by a Honda GXV 660 twin cylinder engine, it comes with hydrostatic transmission, which allows for easier control in obstructed areas. In simple terms using it is similiar to driving an automatic car; the more pressure you put on the foot pedal the faster you will travel, releasing the foot pedal will slow you down, allowing you to remain in complete control at all times. Its articulated steering system ensures that wherever you go the rear wheels will always follow precisely in the track of the front wheels. The hydrostatic transmission, coupled with it articulated steering system, makes the Stiga PARK PRO 540IX a highly manouverable machine. Ergonomically placed controls, an extra high comfort seat with armrests, along with hydraulic power steering adds to the driving experience. The articulated chassis design also means that the simple and effective 4WD system eliminates any tyre scuffing on your lawn whilst turning, as well as ensuring excellent traction in wet conditions and on sloping ground. Equipped with an articulated chassis, its 125cm Multiclip Combi deck leaves no clippings to dispose of saving you time, money and effort. The electronic control panel, which is located conveniently at the side of the drivers seat, serves a dual purpose as both engaging the blades on the deck and selecting your preferred height adjustment can be done electronically at the flick of a switch. The Stiga PARK PRO SVAN is also an extremely versatile machine. Its Multiclip system recycles grass clippings, turning the grass into fertiliser for your lawn, while its rear discharge option deposits the grass behind the machine. This is an appropriate alternative to employ when the grass is long. Blade Engagement Electric Wheel Sizes Front 17", Rear 17"
With genuine articulated steering the rear of the vehicle follows the tracks of the front wheels. Makes it easier to drive between bushes and trees. You have full control in all situations.